My needles have been on fire this week and I’ve managed to complete the Lush cardigan I started last Sunday. Today I sewed in the last of the ends and washed and blocked it. I haven’t got a photo of the completed cardigan as the recipient hasn’t seen it yet. Here’s one of the buttons though, as I do love choosing them to match projects. 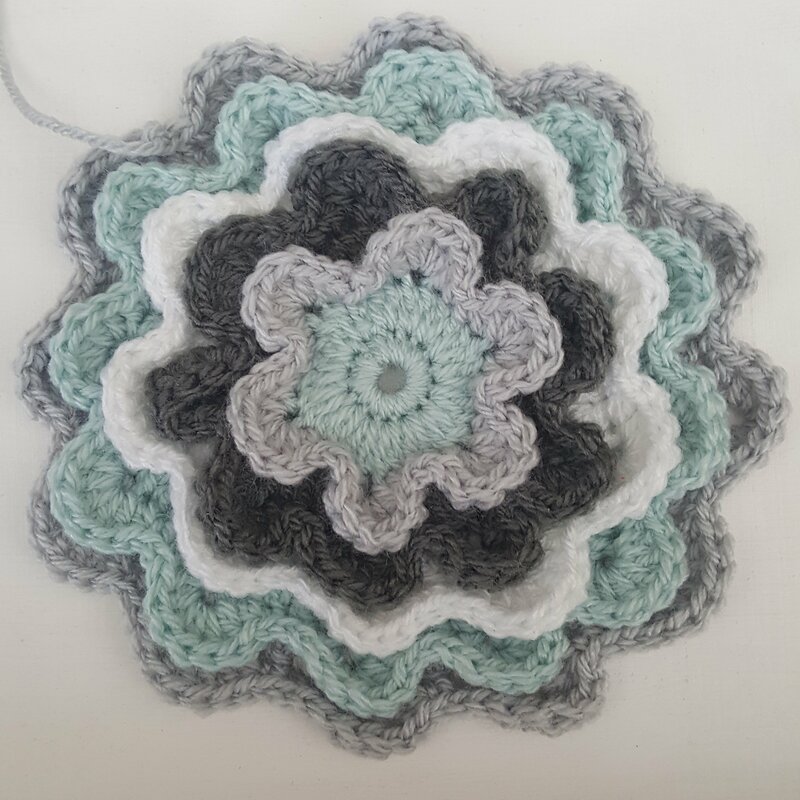 I also managed a couple of rounds on the blooming flower cushion. I’m planning on working on it a lot now until I get more orders for other crocheted items. How’s your week been? Have you got anything finished? Let me know! Thanks, they weren’t especially cheap but I like them too. I love the design on the button! 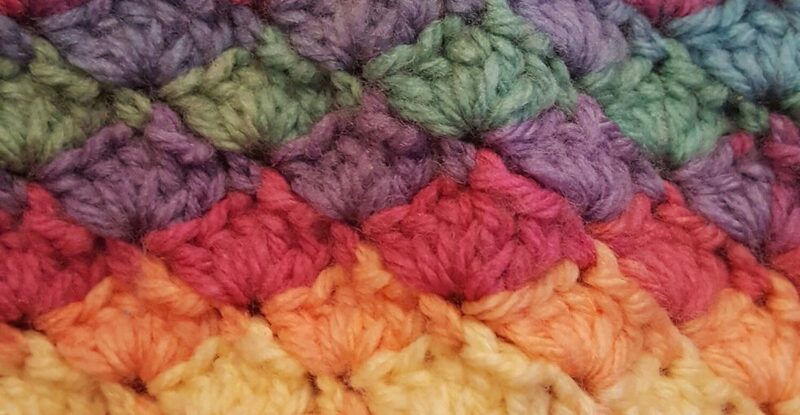 Those little touches are what make hand made projects so special.your cushion is coming along nicely, I like the combination of colours there. Thank you, I love trying to make sure my projects are designed to the last detail. The cardigan … WHAT A BEAUTIFUL COLOUR THAT WOOL IS!!! It’s kind of … what would happen if Butter and Honey fell in love. They’d make that fantastical blended colour of lovey doveyness. The button … perfection. Love it. Now onto that flower(s) … I would buy that exactly as it is. Although .. having it as a cushion … well I’d display it, but woe betide anyone who thought they might like to sit leaning against it. OH. MY. STARS!!! There would be scolding going on which the earth had never seen before. (Thinking of Daughter No.2 here … and Son in Law too come to think of it). She comes in, and practically throws herself on the sofa. I swear to dog that one day that sofa is going to throw up the white flag and break in the centre! Love both the projects, and can’t wait to see the cardi in full. It looks amazing. Thank you, I’m going to look! The button(s) are gorgeous. Hope you share the whole cardigan soon. Thank you, I’ll make sure I get a good photo! ooh, those buttons are awesome! Thank you, they are such calming colours! The flower design is gorgeous! It looks big, how big is the pillow you’re making? 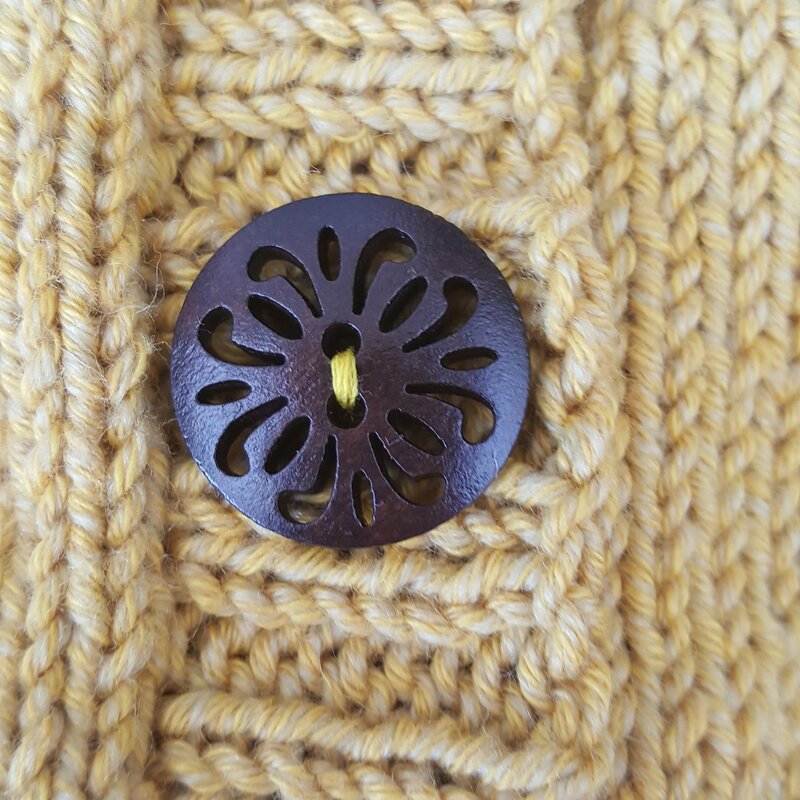 I love the buttons you chose for your cardigan; I’ve eyed those for some of mine but have always ended up going with other buttons. I imagine those are warm to the touch and somehow lighter than other buttons. A good choice! Thank you, I love wooden buttons for natural colours. You do always chose the best buttons! I love the colour combination for the flower cushion and those buttons are so pretty. Thank you, I love choosing colours and trying to coordinate them. Thank you, Lol, finishing touches matter! Love the button, it really gets me curious about the cardigan! Gorgeous! Such a lovely button too!